Stunning Luxury Home/Pool/Spa/Total Privacy/Mtn Views! 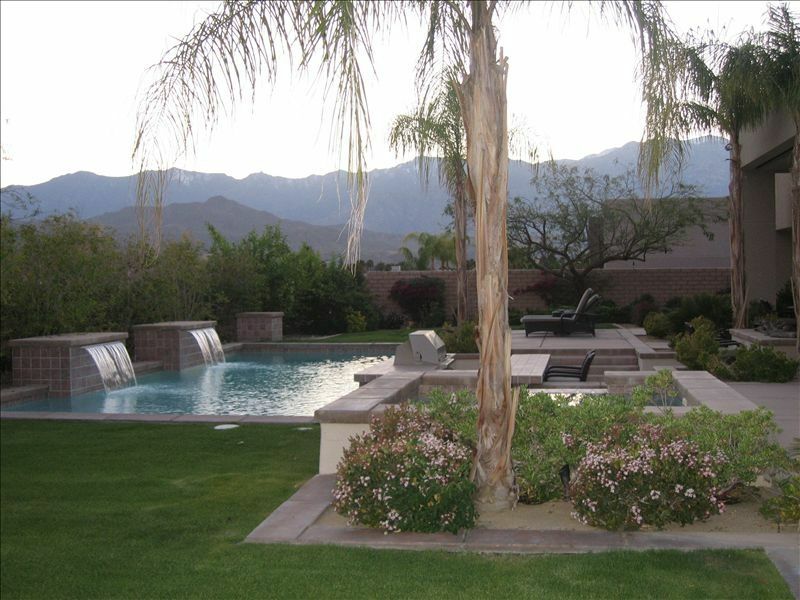 Rancho Mirage Luxury Home in prestigious small-gated community. Minutes away from world famous El Paseo, shopping centers, theatres, dining and golf courses. This exceptional home has extraordinary views of the San Jacinto mountains and yet complete privacy. High ceilings and walls of glass highlight this truly unique home. Stone and granite throughout, custom cabinetry. Highly up-graded designer furnishings, and custom art work create a uniquely beautiful setting. Gorgeously landscaped with fabulous mountain views. Beautiful saline pool (14'x37') and spa (nearly 8'x8'), water falls, SWIM-UP BAR with built-in Wolf barbecue. 'Outdoor Living Room' furnished with high quality patio furniture, ceiling fan, evaporative cooler, and remote controlled sunscreens. Fully equipped Gourmet Kitchen with granite counters, Sub-Zero refrigerator, opens to family room with huge built in flat screen television. Four fireplaces: formal Living Room, Family Room, Master Bedroom and outdoor patio. Blue Ray/DVD player Home Theater w 55' LED TV setup & DirecTV whole home DVR service. Formal dining room complete with granite built-in buffet, special cabinetry and built-in Sub-Zero Wine Refrigerator. 3 bedrooms 3-1/2 baths. Sleeps 6. Air conditioning/Heating through out (3 zones) and large quiet ceiling fans in each bedroom. TRULY A ONE OF A KIND MUST SEE!! This home is simply beautiful, every last detail is perfect. The bedrooms are decorated like a fine hotel and super comfortable! The kitchen has every amenity you could need and plenty of condiments for your use. The back yard and pool area are worthy of a really nice hotel and the views are stunning. I can not wait to go back. Owners are extremely easy to deal with. Highly recommend! A great place to enjoy the valley. This home is beautifully decorated and it enjoys a great central location. We appreciated the proximity to good golf, dining, groceries and El Paseo. A quiet, restful home that we would revisit in a heart beat. The owners are wonderfully nice people who are focused on your experience. Give it a try, you will not be disappointed. The pictures do not do justice to this beautiful home. The yard, pool, gas outdoor firepit and indoor fireplaces, interior furnishings, appliances, linens, generous spaces, art work and lighting effects all were outstanding and greatly exceeded our expectations. The location is easy to find and explain to visitors, totally private, and very close to all the best shopping and restaurants. We hope to be back regularly. We are already planning next year's stay at this property. It had everything we were looking for: immaculate, modern, exquisitely furnished, private, and gorgeous distant views of the mountains. We especially enjoyed the patio and pool, with its swim-up bar. Our only complaint ...if it can be called that... is that the master suite is over-the-top luxurious, while the other bedrooms were "merely" beautifully furnished. This Rancho Mirage jewel of a home is not only impeccably decorated, it’s functional, and comfortable. The layout of the house, with three en-suites, each with their own patio doors, along with the open floor plan of the living space, was perfect for both easy socializing and complete privacy. The attention to details, like top quality linens and dinnerware really made us feel special. The pool is stunning, and absolutely private, and the development where the house is located is quiet and extremely well-maintained. We couldn’t have wanted for anything more, felt totally pampered, and thoroughly enjoyed everything about this fabulous, 5 Star home.